If you have a question about our products or services that we haven’t covered elsewhere on the site, you can find the answer here. I have coolant leaking into the oil. Will K‑Seal fix this? For K‑Seal to work effectively it needs to be exposed to an atmosphere. This can be externally or internally (across the head to the cylinders). Where coolant is leaking into the oil it is less likely that K‑Seal will be exposed to an atmosphere. Therefore, there is a reduced chance of K‑Seal making a successful repair. I have oil leaking into the water/coolant. Will K‑Seal fix this? No. K‑Seal will only fix coolant leaks and cannot stop oil leaks. I have a leaking hose. Will K‑Seal fix this? No. 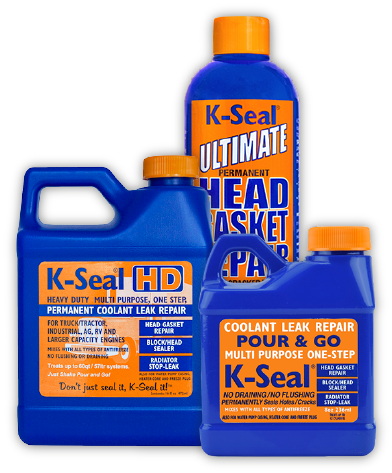 K‑Seal can only fix leaks in ‘solid’ parts of the cooling system including the head, head gasket, block, core plug, radiator and heater matrix. I have white smoke coming from the exhaust. What does this mean? What you are seeing is not smoke but steam condensing as it exits the exhaust and hits cold air (just like when a kettle boils). The steam is the result of water entering the cylinder(s) due to a head gasket failure. The water boils in the cylinder and is expelled with the exhaust gases. You may also notice reduced engine performance, starting problems and fouled spark plugs. My windscreen keeps misting up. What does this mean? One cause of misting windscreens is when there is a leak in the heater matrix. The heater matrix transfers heat from the coolant into warm air to heat up the cabin. If there is a coolant leak in the matrix, then this contaminates the air entering the cabin. The moisture then condenses on the windscreen cause the misting. You may also detect the smell of coolant/antifreeze and, in extreme cases, you will notice damp patches in the foot wells. I have a creamy deposit in the oil filler cap/neck? What does this mean? This indicates that you have water (coolant) leaking into the oil due to a head gasket problem. The water and oil combine and emulsify (a bit like mayonnaise) which results in the deposits around the filler cap. My cooling system is pressurising and coolant is being blown out of the expansion tank. How can K‑Seal fix this? Remove a top hose from the radiator and pour the K‑Seal into the hose so that it enters the cooling system directly. Drain a few quarts of coolant/water from the system, mix this with the K‑Seal and then pour it back into the system. This helps deliver K‑Seal right inside the cooling system giving it the best chance of making a repair. Even though there is pressure coming into the cooling system, there is almost always a small movement of coolant back across the crack as the pistons move up and down within the cylinder. K‑Seal is drawn into the crack and is then cured as the hot gases pass back through the crack. Is there any special preparation I need to do before using K‑Seal? Unlike other block sealers, K‑Seal is a simple ‘pour & go’ solution. Shake the bottle well and then add the entire contents to the cooling system where you would normally top up the coolant/water. How much K‑Seal do I need? 1 standard bottle of K‑Seal (236ml/8floz) will treat cooling systems with a capacity up to 20 litres (this covers motorbikes up to light commercial vehicles). For larger cooling systems use our Heavy Duty (472ml/16floz) size K‑Seal. Should I add K‑Seal to a cold or hot engine? K‑Seal can be added to a cold or a hot engine. The important thing is that, once K‑Seal is in the coolant, you run the engine up to operating temperature to make sure that the coolant/K‑Seal is flowing freely around the system. Should I add K‑Seal to the coolant or the oil? K‑Seal must only be added to the coolant. Do not add K‑Seal to the oil. Do I need to leave K‑Seal in the cooling system after it has sealed the leak? It is not necessary to leave K‑Seal in the cooling system after the leak has been repaired although it will do no harm if you do so. Once K‑Seal makes a repair then that repair is permanent, regardless of whether you leave it in the system or not. How long does a repair made with K‑Seal last? When K‑Seal repairs a leak then that repair is permanent. I used K‑Seal but it did not stop the leak. Unfortunately, there are some problems that are beyond even K‑Seal’s ability to seal leaks. In the unlikely event this should be the case please get in touch with us and we can investigate why this did not work. If I use K‑Seal to fix a head gasket leak, will I have any problems in the future if I want to replace the head gasket? K‑Seal repairs a head gasket leak by filling the crack with ceramic microfibers that cure to make a permanent repair. If you decide to replace the head gasket at a later date the K‑Seal repair will be removed with the old gasket. What engines can K‑Seal safely be used with? K‑Seal is suitable for use with all water cooled engines, regardless of size or fuel type. What is the difference between coolant and antifreeze? Coolant and antifreeze are just different names for the same additive. Cooling systems now contain additives which not only prevent the water in the system from freezing but also help the cooling process in hot weather. Plus, the additives help prevent corrosion and also lubricate the cooling system. Will K‑Seal mix with DEX-COOL antifreeze? Yes. K‑Seal is compatible with DEX-COOL and all other types and brands of antifreeze/coolant. Unlike many other products, there is need to drain or flush the cooling system before adding K‑Seal. Just shake, pour and go! Will K‑Seal mix with Evans Waterless Coolant? Yes. K‑Seal is compatible with Evans so long as the dosage of does not exceed 5% water within the cooling system. In a family size vehicle even the 16oz / 472ml size K-Seal should not exceed this maximum. Is K‑Seal compatible with all types of coolant? Yes. K‑Seal does not react with coolant or other additives that may already be present in the system. Can K‑Seal be used in a hot water central heating system? The short answer is yes. A water based heating system is very similar to an automotive cooling system. You have a hot liquid flowing around a closed loop with the intention of transferring heat from the system to the surrounding environment through radiation. If there is a leak in the system this compromises the efficiency for the system and can lead to long term damage. Adding K‑Seal to the central heating system can help repair leaks up to 0.6mm in size without the need to drain the system. Simply add K‑Seal to the heating system where you would normally top up the water. K‑Seal will not cause any harm to the system and will not damage the pump. If the system is fitted with a filter, then this should be bypassed before adding K‑Seal. K‑Seal meets ASTM D-3147. Will K‑Seal block anything in my cooling system? K‑Seal will not block the cooling system and is safe to use with all types of water cooled engine. Is K‑Seal suitable for use with aluminium radiators? Yes. K‑Seal is suitable for use with aluminium and all other radiator materials. It will even repair leaks in hard plastic radiator casings. Can K‑Seal be used as a preventative measure? It is possible to add K‑Seal to the cooling system even if there is no leak. However, the effectiveness of K‑Seal reduces over time and, due to the varying conditions in different cooling systems, it is not possible to determine exactly how long K‑Seal will remain effective.